Sarah Marie Cramer, 20, of Herron passed away suddenly in her sleep on Friday, November 30, 2018 at her home due to medical complications. Sarah was born in San Diego, CA on January 29, 1998 and was adopted on June 7, 1999 by Duane and Amy (Edmonds) Cramer. 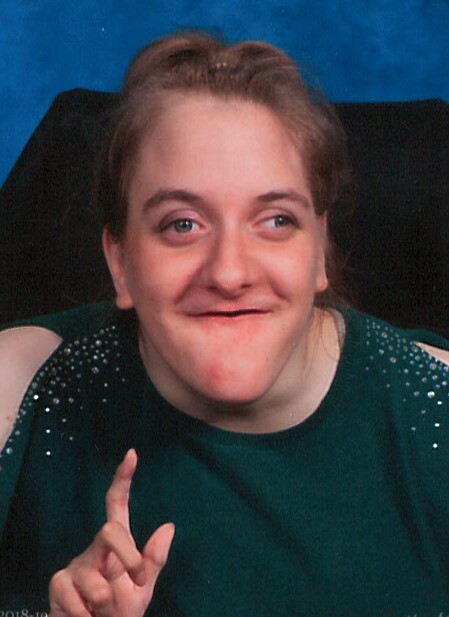 Sarah was a very special little girl who won the hearts of many with her cute smile, bright eyes and gentle spirit. She loved being read and sung to by her mother as well as all the silly things mom did with her. Sarah had fun playing with her dad, by stealing his hat and scoring at air hockey on him. In January, Sarah moved into Chism Adult Foster Care Home and flourished. She was well taken care of and loved this new extended family in her life. Through the years, Sarah liked hanging out with her sister, Cathy, brother, Anthony and kids her age. Sarah was a blessing to three particular women in her life, Lori Burgess, Amy Cramer and Jenny Chism. Each of whom became mom to this precious young lady at certain times in her life. She attended Pied Piper Opportunity Center and will be greatly missed by the students and staff. Surviving are her mother, Amy (Larry Thomas) Cramer; father, Duane Cramer; 2 siblings, Cathleen Cramer, Anthony (Kateline Mispaugh) Cramer; special brothers, Kaden and Kalen Moore-Thomas; grandparents, Bruce and Joan Edmonds, Gail Cramer; aunts and uncles, Bonnie (Dan Fransee) Kihn, Darwin (Lynn) Edmonds, Michael (Carol Klien) Cramer, Terry (Patti McCormick) Cramer, Todd (Laura) Cramer; many cousins and friends. Sarah was preceded in death by step-mother, Cindy Cramer and grandfather, Gerald Cramer. Visitation will take place at the Bannan Funeral Home on Tuesday from 2-8 p.m. and on Wednesday from 1 until the time of the funeral service at 2 p.m. with Rev. Kerry Clark officiating.